Ever since the Soviet Union launched Sputnik I, the world’s first satellite, on October 4, 1957, humankind has been on an upward trajectory, reaching farther and farther into space. USA’s Explorer 1 soon followed Sputnik I, and by May 14, 1973, we were launching the first American space station. In fact, Skylab’s final crewed mission concluded with their return to Earth on this very day – February 8, 1974. Skylab, in orbit around the Earth from 1973 to 1979, weighed 169,950 pounds and housed a workshop, a solar observatory, and a few astronaut crews. Creating such an elaborate structure – and launching it into space – was a huge endeavor, one that was not without problems (NASA). NASA noticed almost immediately after the launch of Skylab that things hadn’t gone as planned. The station’s meteoroid shield and one of two solar panels had ripped off, and a part of the shield had wrapped around the remaining solar panel, keeping it from deploying. It took quick thinking, teamwork, and a lot of problem-solving to come up with a plan before the crew of astronauts launched on May 25, 1973. When the astronauts finally reached the space station, they were able to set up a new solar shield, which quickly lowered the temperature inside the lab, and free the jammed solar array, thanks to innovative solutions created beforehand. After those problems were solved, the crew was able to complete their mission. Since then, space exploration has included many successes and failures, but regardless of what happens, we continue to innovate. Where government funding stops, private innovation takes over, and the search for answers continues. Pizza Delivery – to Space! Solving problems and exploring new frontiers is enough to make anyone hungry. 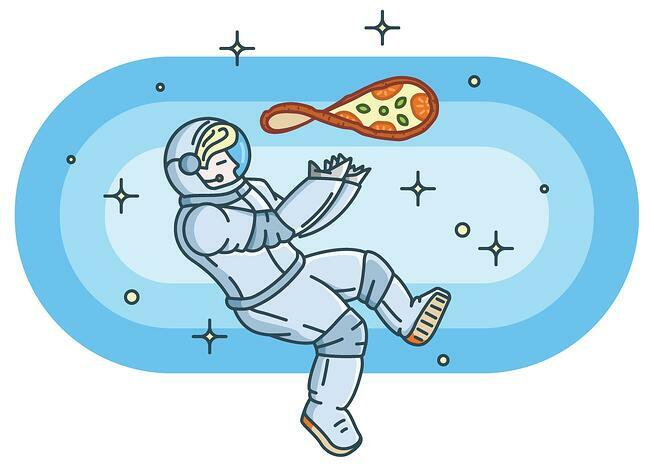 Cravings for casual comfort food like pizza are pretty common among the astronauts. Makes you wonder what the delivery range is for a pie. Looks like for Pizza Hut it’s to infinity and beyond. Or at least to the nearest space station. In 2001, Pizza Hut successfully delivered a six-inch pizza to Russian cosmonaut Yuri Usachov aboard the International Space Station (ISS) (BBC). The pizza had the traditional pizza sauce and cheese, but it contained extra salt and spices, and it had salami instead of pepperoni as research revealed that the shelf life of pepperoni was not up to the 60-day testing period. Obviously, the pizza was not delivered hot; it was cooked in the ISS oven (SpaceRef). And in November 2017, another pizza delivery was made to the ISS. This time the ISS director, Kirk Shireman, surprised the ISS team when he sent all the ingredients to make perfect flatbread pizzas up on a cargo delivery after Italian crew member Paolo Nespoli mentioned missing pizza. The crew created and ate their pizzas in zero gravity – making it acceptable to play with their food at dinner (Fortune). Innovation and problem-solving are important components of both space and STEM careers. Teamwork is another. Whether a mission involves delivering a pizza to space or fixing a solar array, teamwork and problem-solving are essential. And STEM activities and curriculum, such as Pitsco’s STREAM Missions for Grades 3-5, including titles such as Space (Grade 3), Space Exploration (Grade 4), and Solar System (Grade 5), give students the opportunity to develop these kinds of skills. By developing both their academic and soft skills, students get a head start on reaching the stars – or wherever their careers might take them. Hungry to learn more? Check out our Missions and visit NASA’s site for some other great STEM resources. Oh, and grab a slice while you explore. We hear tomorrow (February 9) is National Pizza Day!